Sheryl Maia promotes a positive attitude everywhere she goes and is dedicated to her career and her colleagues. Eight years ago, Sheryl started her EMS journey as a call taker and later became a dispatcher; today, she is a Dispatch Training Officer. In her role, Sheryl is responsible for dispatching multiple county divisions and ensuring that communications personnel consistently follow protocols and procedures. Sheryl also coordinates reviews of high-level emergency calls and is actively involved in quality improvement activities. Sheryl played a pivotal role in the Portland Communication Center’s successful re-accreditation bid last year. 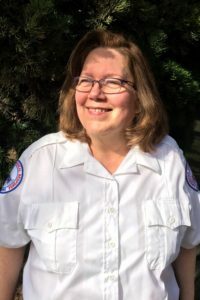 As a member of her agency’s Angel Team, Sheryl helps provide meals, groceries, babysitting, and other materials to EMS colleagues enduring family emergencies and other crises. Sheryl also participates in a program designed to educate parents about the danger of shaking babies.